This is my first time reading a true-crime novel and it is a bold one. I have been plugging through it for awhile and it has kept me riveted. This book was smartly written and was researched very well. It reads like a novel yet it is non-fiction and can be quite scholarly, almost like a textbook, in places. I can't really say that I liked it because although it was captivating it was particularly sad. After all, it struggles to answer the age old question of how someone like this with substance, propriety and a seemingly upperhand on the world could become a murderer? So, I don't feel the need to recommend it, unless and perhaps I knew the person was interested in true-crime, simply because it was full of vivid descriptions and a lot of explicit details, some of which was uncomfortable for me to read, personally. In the beginning of the novel, there is a lot of thought-provoking set up and it is hard to imagine in the world we live in today how this could ever happen. 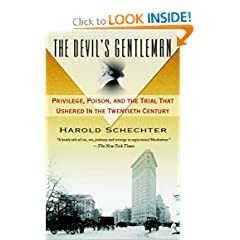 This was in the 1890's, Schechter vividly gives us a fact based explanation of how society at that time was set up and what surrounded this early age of an almost incomplete methods of forensic science. I love how Schechter uses all of these items to capture the people surrounding this tumultuous legal case which forces their characters out, good or bad, right or wrong, before and after the case was even revealed. As this, understandably at the time, glossy, sensational case based out of New York City colorfully unfolds, it is like dynamite. It explodes the main persona, Roland Molineux, and all those who surround him in changing their life vastly and utterly complicated than ever before. Personally, I don't like Mr. Molineux and felt like he was the villain of the novel. Allegedly, a poison was sent in the mail, packaged in a small blue vial commonly used for Bromo Seltzer being an ailment for headaches at the time. No one knew exactly who sent it, as there was no return address, but it came out that it was sent to one of Molineux's known rivals, Harry Cornish. Another fated poison was also sent to another rival of Molineux's, Henry Barnet which makes a little bit more sense because of Henry's connection to Blanche. Although, in the end Blanche does marry Molineux. For either man, enemies mostly in Molineux's mind, there was not really a super strong or valid reason for them to become fateful victims of the poison. Only one of the intended victims actually dies and the other comes close but recovers only at the expense of the dreaded personal loss of his cousin, Mrs. Katherine Adams, who took the poison meant for him. "Not to be outdone by his archrival Hearst - who continued to run periodic pieces on the trial by Clement Scott- Joseph Pulitzer brought in his own celebrity from the theatrical world: famed American playwright Bronson Howard, author, among other hits, of the enormously successful Civil War drama Shenandoah." Instances like this were brought out time and time again. I've never known what it must've been like to get your news only from the newspapers. I did get a real feel for the way journalism was like during this time. It was entertainment hinging only on a few collective bits of truth. Sensational. I don't think I could read this myself, but I have a friend who loves True Crime and who spent her grad school years studying, especially when it came to serial killers. I think I'll mention this book to her. I really think I'd like this book. Great review!